The following is a guest post by Marko Grdesic. The work of Thomas Piketty needs no introduction. Piketty is that rare case – an academic superstar. What has been the reception of his work in the social sciences? This blog post will present the results of a citation analysis. How was the citation analysis conducted? First, through a Google Scholar search, I located all the works that cite Piketty’s Capital. I included the first 100 works, ranked by how many times the works themselves were cited. Second, the same procedure was repeated for “Income inequality.” Next, I conducted a search for “Piketty” in several of the main academic databases: EconLit for economics, SocINDEX for sociology and Worldwide Political Science Abstracts for political science. Only articles which were themselves cited at least once were included. Articles by Piketty and his main co-authors (Saez and Atkinson) were excluded. I also excluded non-academic publications such as The Economist, NY Times or blogs. In the end, this led to a database of 255 works. What kind of information could be extracted from this? After a lot of reading and a largely fruitless search for Piketty memes, I decided to code the following: (1) Is the work of Piketty evaluated as positive? (2) Is the work of Piketty evaluated as negative? (3) Is the citation of Piketty essentially a courtesy citation, so that it could have been replaced with another reference? (4) Is Piketty’s work referred to primarily as primary data, i.e. to substantiate an empirical point such as: “The wealth of the top 1 percent has risen sharply in recent decades.” I also tracked the number of citations that each work in the database had (as reported by Google Scholar) as well as the number of times that Piketty’s name appears in the text. This last piece of information is a useful indicator of how detailed the examination of Piketty’s work is. Each item was double-coded and reliability scores were high: Cohen’s Kappa and Krippendorff’s Alpha were around 0.93. Some authors both critique and praise Piketty’s work at the same time. For example, out of the 39 works that present Capital in a positive light, a total of 29 also presented it in a negative light. In other words, the two need not be exclusive. A good example of this is Deirdre McCloskey’s essay: “Nothing I shall say – and I shall say some hard things, because they are true and important – is meant to impugn Piketty’s integrity or his scientific effort.” This suggests that many authors gave Piketty’s work serious consideration and weighed its strengths and weaknesses carefully. 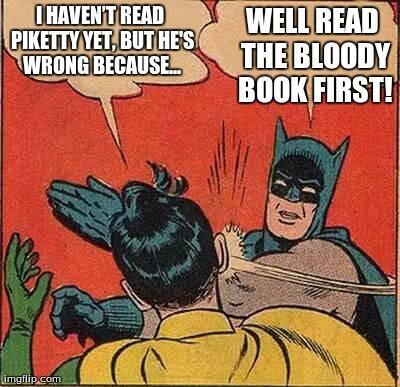 But there are also many casual readers of Piketty. For example, about 30 percent of the works that cite Capital really do so as a courtesy, such that the reference to his book could easily be replaced with a reference to any other work about inequality. “Income inequality”, on the other hand, was most often cited as data: about two thirds of the works that cite it refer to it in that way. Differences across disciplines are also interesting. Out of the 52 works that were gathered from the economics database EconLit, a total of 20 had positive readings while 27 had negative readings. This suggests a slightly negative reception of Piketty’s work in economics. This is driven primarily by the reception of Capital, which has sparked passions more than “Income inequality.” The number of works drawn from the sociological database SocINDEX is not high, so interpretation needs to proceed with caution: a total of 19 works were gathered. Within this group, it seems that Piketty’s work evokes stronger reactions: around 84 percent positive and 80 percent negative. Once again, this is mostly driven by the reception of Capital. In other words, both economics and sociology have had some rough things and some nice things to say about Piketty. On the whole, sociology seems to be a bit more supportive. But again, it should be re-iterated that not all economists are hostile to Piketty. Some prominent names have come to his defense. For example, Branko Milanovic wrote in his review of Capital that “we are in the presence of one of the watershed books of economic thinking.” For the political science database WWPSA, the numbers are even smaller so no conclusions can be offered. In addition, it seems that works that mentioned Piketty’s name more frequently were more likely to present both negative and positive points. In other words, detailed discussion of Piketty led readers to a rather even-handed assessment of his work. The coefficient for the variable that tracks the number of times his name appears is statistically significant and positive in models 1 and 2. This finding was replicated in the third model: the variables that track positive and negative assessments are both positive and statistically significant predictors of the number of times his name is mentioned in the text (this was double-checked with an interaction term too). In other words, the closer one reads Piketty, the harder it is to make simple judgments about his work. Consider David Soskice’s essay, which mentions Piketty’s name about a hundred times. Soskice writes that Capital is “one of the most compelling books I have read in a long time, lucidly and easily written and exceptionally interesting”, but he also adds that Piketty’s “parsimonious mathematical model (neat and clever though it is) almost completely ignores the interacting relations between politics, history and technological change.” In other words, the more deeply one reads Piketty, the more likely it is that one will present the positive and the negative together. • The academic reception of his work is split: as many see his work in a positive light as in a negative light. • The reception of his work in both sociology and economics is split, but the balance tilts towards more positive in sociology and more negative in economics. • Positive and negative evaluations combine in those works that treat Piketty in most detail. • Although the existence of r>g t-shirts is welcome, we are still in dire need of a Piketty meme.